Safariland 7TS ALS Tactical Holster w/Quick Release - Model 7305 FREE SHIPPING! 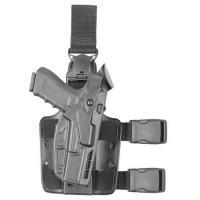 This tactical holster from Safariland is a convenient, comfortable and safe carrying solution for your firearm. The Automatic Locking System (ALS®) secures the weapon when holstered, but once deactivated it allows an unobstructed, smooth straight up draw. The Self Locking System rotating hood provides an extra layer of defense and users can also install a Sentry accessory for total security. The proprietary nylon material is extremely durable, capable of withstanding temperature extremes from -50 to 300 F, but smooth enough that it does not cause abrasions. Internal stand-off surfaces allow dirt and water to clear the firearm, preserving its finish and function. It can also be immersed in water indefinitely without any loss of function or change in shape. The holster mounts securely and comfortably with a standard double leg strap, complete with mounting holes for accessories. The adjustable vertical leg strap has a quick-release detachable harness for additional versatility. ©2002-2019 CopsPlus.com: Safariland 7TS ALS Tactical Holster w/Quick Release - Model 7305 FREE SHIPPING!